This week has been a work hard, play hard kinda week! I’ve been treated to no less that two sumptuous massages, spent an evening cuddling puppies with Very.co.uk and as you read this I’m now on a flight to NYC ready for Fashion Week! And that’s just the play hard bit.. I won’t bore you with the details of me working hard! … Enjoying sunny walks and an unhealthy lunch. We live really close to Clapham Common so on Sunday we made the most of the beautiful weather and went for a lovely long walk, stopping for a bite to eat at the new No 32 The Old Town restaurant. We sat outside and enjoyed Burgers and Mac n Cheese – hey, Sunday is cheat day right?! … Pampered by the super team at the Rosewood. When an email popped in my inbox to try out the lovely massages in the Rosewood hotel in Holborn, I didn’t even check my diary, there was no way I was missing out on this! I used to study at London College of Fashion and walked past the Rosewood everyday, admiring the grand building and luxurious interiors from the windows. I’ll do a whole post on the massage and my experience there, but if I had to describe it in three words? Bliss, Heaven, Opulent. … Then getting a mini massage and other treatments at #LFWRetreat! Yes I know, I’ve been spoilt this week! At the Red Bull HQ, the #LFWRetreat returned and Press, Bloggers and Models were invited to indulge in some Pre Fashion Week pampering! I signed up for almost every treatment (hey, they said no limit!) and this started with an Energy Boosting massage from Spa & Massage. An uplifting treatment, with lots of fast moving deep tissue massage techniques which left me feeling bright and energetic afterwards! I then had some delicate Eylure lashes applied, perfect for everyday wear, before heading to the Wella SP area for a glossing treatment and blow dry! With my new glossy, bouncy curls I then met with the lovely Amanda at Pixi Beauty and she introduced me to their gorgeous Spring beauty collection. Finally, I managed to sneak in for a CND Shellac manicure with Sweet Squared. I went for Dandelion as the main colour, and Lily Dream Adhesive to achieve the unbelievably glitter accent nail. I am pretty obsessed with how my nails look now, and might have to buy the kit online to do it myself! … Tempted to steal all the puppies from Very.co.uk! They dropped hints about ‘furry friends’ at the #VeryVIP Valentines event, and my wishes came true when I walked into the Ice Tank Studio and was told that there were PUPPIES!!!! Before even dropping off my coat and bags I ran over to cuddle the adorable little babies, scooping up little Maddison and not letting her go for most of the evening! Lucy Watson even thought I was one of the dog owners, asking me if she was allowed to pick them up… it was at that point that I realised I’d been kissing them for far too long! The new collection on Very.co.uk features some stunning lingerie, I particularly loved the delicate grey silky playsuit and matching dressing gown! It was a super night, and they’d thought of everything, from delicious cocktails, selfie sticks, metallic tattoos, oh, and did I mention that there were PUPPIES?!! … Flying to NYC! Yes, if you’re reading this on Sunday morning then I’ll hopefully be fast asleep having just arrived in the city. If I’m awake… it means I’ve got jet lag! 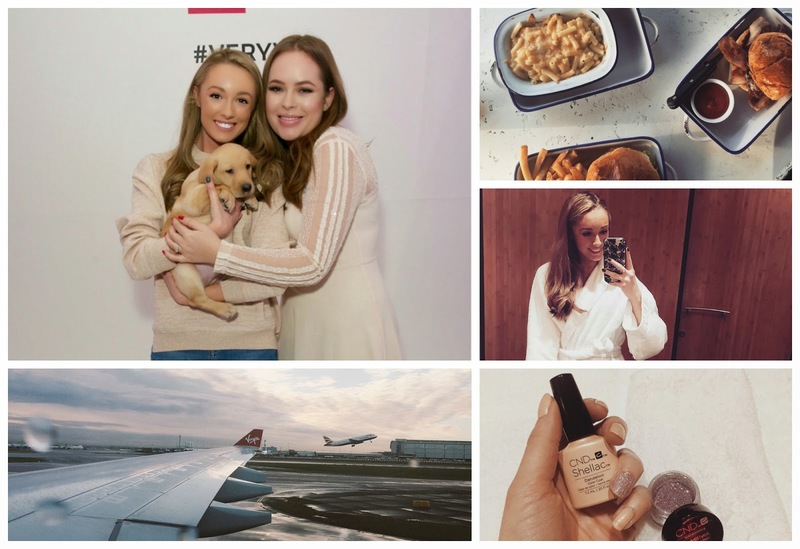 I’m here til Friday and will be seeing loads of shows and doing some really exciting things over Fashion Week, so keep an eye on my Instagram and Twitter to see what I’m getting up to! Sorry about blurriness, iPhone didn’t cope well with the pink lighting!